When was Youth Spirit Artworks founded, and why? Youth Spirit Artworks was founded by long-time Quaker and homeless activist Sally Hindman in 2007 as a response to the dire need for jobs and job training among homeless and other underserved young people (ages sixteen to twenty-five) in the San Francisco Bay Area. Youth Spirit provides these youths with a means of earning money via art production while gaining skills and experience in specific occupations. We think of art as a vehicle for healing and transformation. Who is your audience, who are you trying to serve, and who do you hope to reach? Youth Spirit’s “audience” largely consists of long-time residents of South Berkeley, Berkeley, and adjoining neighborhoods, as well as people from the larger Bay Area and Northern California. 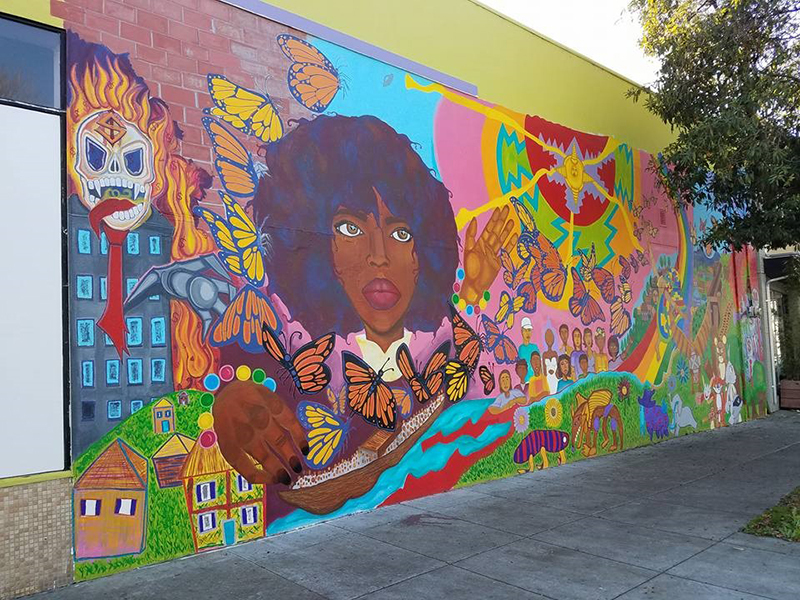 As we develop our new youth-led mural tours of South Berkeley, build out our 1,500 square-foot youth-run gallery and online store — through which we sell merchandise related to the murals in our Alcatraz Alley Mural Park and increase the distribution of our homeless newspaper, Street Spirit — we hope to attract tourists and progressive shoppers. 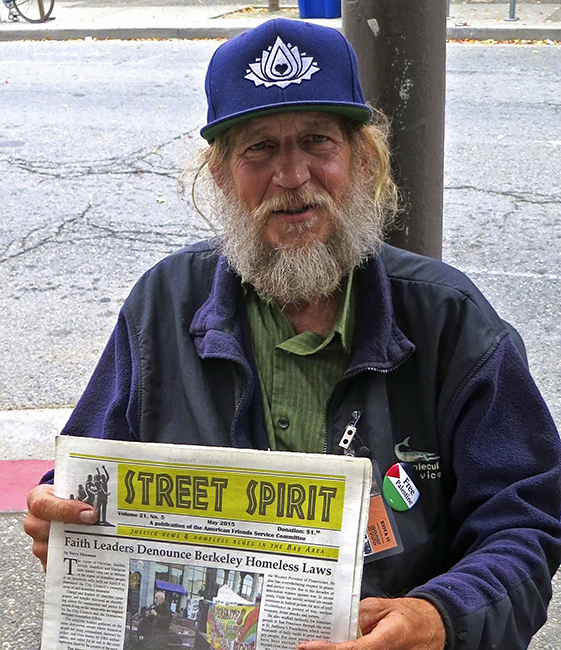 YSA serves over 150 homeless and unstably-housed young people each year for as many as ten hours each per week, and we support the livelihoods of over ninety homeless and low-income adult street newspaper vendors through Street Spirit. More than seventy percent of YSA participants are Black and Latinx youth, and thirty percent of our participants are LGBTQI young people facing challenges with their families and other sorts of marginalization. As we grow, we plan to engage more Oakland, Richmond, and San Francisco youth through art-based programming at satellite locations. Making use of Chicago’s Gallery 37 model (where young people are engaged in art making in parks, community centers, and schools, all connected to the Gallery 37 store), we look forward to engaging young makers in diverse Bay Area locations and bringing their work back to sell in our flagship South Berkeley store! As you mentioned, you recently opened a 1500-square-foot, youth-led gallery at 3324 Adeline Street in Berkeley. What drove that expansion and what has the process been like? What sorts of programs and events do you plan to host there? Youth Spirit’s arts, social enterprise, and empowerment-focused programs have grown dramatically since our founding. In 2015–16, as part of a strategic planning process, our youth leaders and stakeholders envisioned an expansion of physical space by adding a second gallery-store and office space to our existing 1,400-square-foot Art Studio and Art Lot (parking lot). In summer 2018, YSA had the chance to rent a commercial storefront on Adeline Street around the corner from our Art Studio and connected to our Art Lot. Although we were not quite ready to acquire our second space, we jumped at this terrific opportunity and were able to rent our new gallery, YSA’s Shanice Kiel Gallery. We are currently holding store hours from 1 to 6 p.m., Tuesday through Saturday. With support from the California Arts Council we host a poetry open mic the third Saturday of every month, led by YSA youth in collaboration with renowned Bay Area poet Charles Blackwell and featuring guests as well as YSA youth poets. In fall 2019 we will create an earned income business plan for YSA and build out the activities and events we will roll out in January 2020. 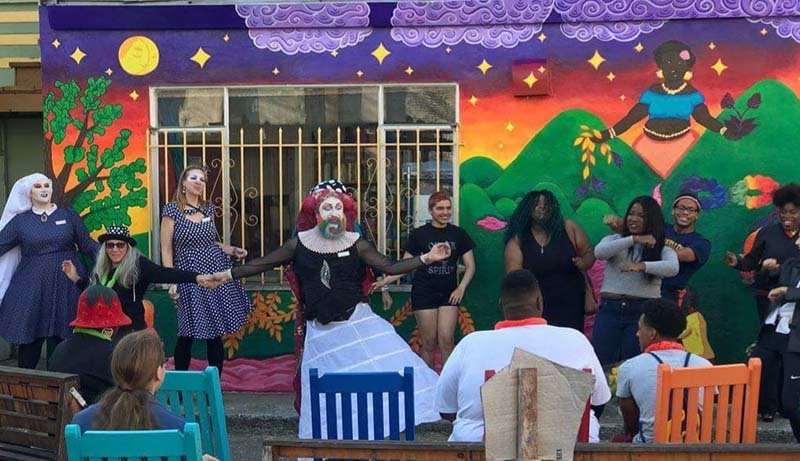 YSA youth with Sisters of Perpetual Indulgence in front of senior artist Kirill Zolin’s Queer Spirit mural, 2018. Photo: Alejandro Ramos. Tell us a little bit about the artists you’re collaborating with: what sort of work are they making, what types of arts jobs and skills are they most excited about developing? Youth artists start by completing our Core Training Program, learning basic professional skills through artmaking, such as: being on time for work, meeting deadlines, doing high-quality work, and developing professional communication and behavior. They also learn independent living skills like financial management; they identify their gifts and passions; they receive wraparound case management and pursue services and other resources needed to meet their personal and professional goals. After completing the Core Training Program they can become apprentices and eventually be considered for staff positions, increasing their responsibility and income. Some of the art projects our Core Training Program youth engaged in last semester included: painting canvasses, creating designs for tote bags and tumblers, making “art pillows,” creating tiny houses, and making jewelry. All of this merchandise is sold in our Shanice Kiel Gallery and online. How has your work been shaped by the rapid gentrification sweeping across the Bay Area in recent years? 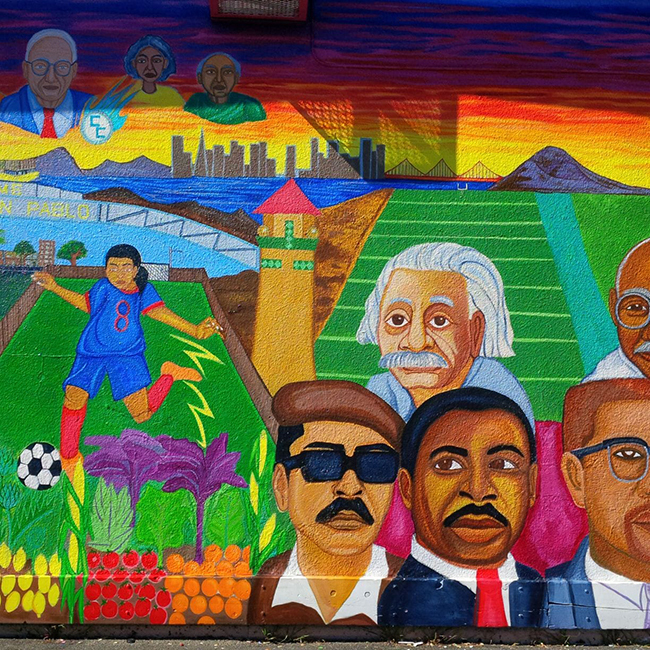 Our work has been shaped in multiple, dramatic ways by gentrification. Skyrocketing rents and the inability of minimum wage jobs to keep up with the market have had an enormous impact on families and on youth homelessness and poverty. More than eighty percent of the young people that Youth Spirit Artworks serves are — even when working — “extremely low income,” living below the poverty level and attempting to simply stay off the street, or out of shelters. Many of them are attending high school or community college while sleeping in a shelter, in a vehicle, or living on the couch of a relative or friend because they cannot afford to pay current rents. Significant numbers of the youth YSA serves have been driven out of the long-time neighborhoods they, their parents, or grandparents grew up in and are living far from where they work or go to school. They consequently spend many hours per week and a huge chunk of their income commuting. We have found the shortage of available housing hugely affects the length of time youth are forced to stay in shelters before being placed in housing. Multiple individuals we work with have lived in the youth shelter for as long as three years, still waiting to be placed in affordable housing simply because there is no affordable housing for them to be placed in. These young people are living long-term with their belongings crammed into a three-by-three-foot locker, sleeping on the floor of a church. The struggle to obtain and keep housing takes up virtually all of the youths’ energy when they are unable to maintain stability. It’s extremely difficult to focus on anything else when something as fundamental as housing is at risk. Aboubacar Komara leading a training, Kaloum Bankhi Tiny House Project, Guinea, 2018. How is Youth Spirit structured? How many people work as part of the organization? Staff or volunteers or both — or some other configuration? Youth Spirit currently has a board of directors comprised of fourteen people, including three former or current participants, and a staff of nine people including an executive director, program director, two senior artists, an interfaith organizer, an art sales coordinator, Street Spirit’s editor in chief, a case manager/job placement specialist, and a lead social worker. We have seven youth leaders and four apprentice leaders, each pursuing job skills growth along one of our seven vocational pathways (sales and entrepreneurship, non-profit management, social media and marketing, community organizing and outreach, art, social work, and journalism). On Fridays, we hold our weekly all-community meal along with an hour-long, often youth-led training session. Our leaders hold a weekly Youth Empowerment Meeting in which they make key decisions around the direction and work of our organization, including art-based community organizing campaigns. As an interfaith organization with a strong commitment to non-violence, YSA’s youth and staff work to make nearly all our decisions by consensus. We are deeply committed to restorative justice practices and engage these whenever possible in our work with youth from our program. What sorts of partnerships (in and out of the art world) have proven most productive for the organization over the years? 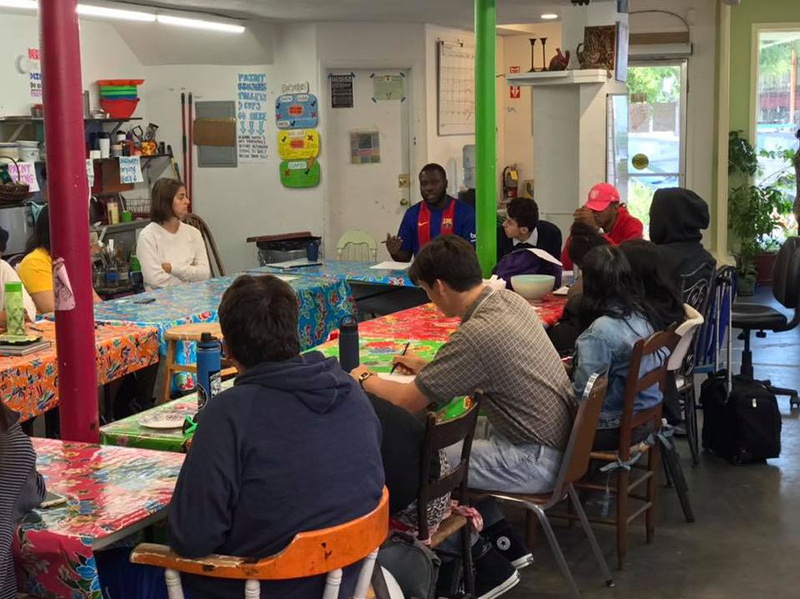 YSA is partnered with over twenty-five Bay Area organizations, including high schools and colleges, social service agencies, galleries, and local businesses. One of the most productive partnerships YSA had early on was with Oaklandish, which gave us their Innovators Award two years in a row; an award that included grant money. Oaklandish designed our logo in 2008, which was an enormous help; they also included us in their annual auction and partnered with YSA on an art exhibit at Oakland Airport. This year we are particularly excited about collaborating with the Walt Disney Family Museum on an exhibit related to ending homelessness through art, opening September 24. We are thrilled that this exhibit opens right before we are scheduled to complete and move youth into our Tiny House Village. Our biggest challenge is building administrative expenses into our budget. Our organization is doing a massive amount of work for a non-profit of its size and yet still has almost no funding for administration. In carrying out our three-year strategic plan, building in funding for administrative costs will be a significant priority. The biggest challenge faced by our youth, however, continues to relate to the need for more below-market, affordable housing. This is why YSA leaders have launched their “100 Homes for Homeless Youth” community campaign, seeking to create one hundred units of dedicated housing for homeless and unstably housed East Bay young people in the next ten years. What else should we be asking you? Ask for more details about our hugely innovative, in-progress Tiny House Village (visit our website for more information) and the ways that art will be woven into this youth-initiated housing community. The twenty-five-house Youth Tiny House Village will serve as a transitional housing for program participants in the East Bay; we’re partnering with more than a dozen local religious congregations volunteering to complete tiny house “builds” toward move-in dates starting in fall 2019.